Yesterday’s post was from MB and in her original comment, she had mentioned using the lip balm as an invitation. This is such a fun idea and very easy to expand on. Why not use a lip balm as invitations to other events besides Spa Parties? 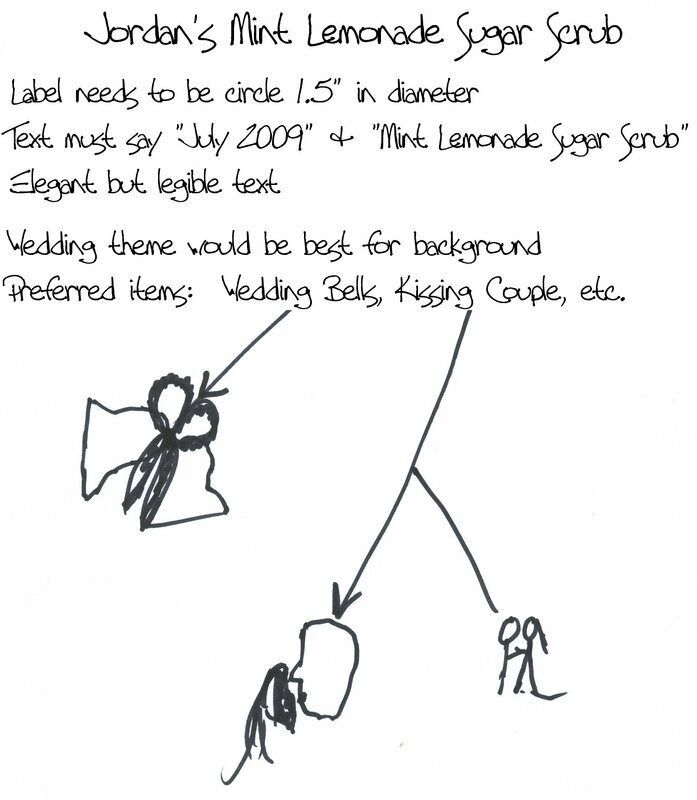 When I made the Mint-Lemonade Sugar Scrub on April 15, I wanted to have a cute label that was wedding related. I wrote on a paper what was needed for the label. You can click on this image to see a larger image. The adorable label below is what they sent back to me. If you don’t have a good idea of what you want, the Graphics Department can still help you. Simply e-mail labels@thesage.com, and someone in our graphics department can help you come up with a great label design that will suit your needs. This is what I sent to the Graphics Department. This is the finished label. This is a fantastic idea! I am doing some decorations for my daughters best friends wedding and I am going to suggest this to the bride to use them as wedding favors! I’m thinking lip balms, tubes for men, jars for women, Hummm… but there are so many other possibilities for her to choose from! I think it would be really nice with a picture of the wedding couple on the labels and their wedding date. A great momento! You will have to show us these wedding favors if they are made!